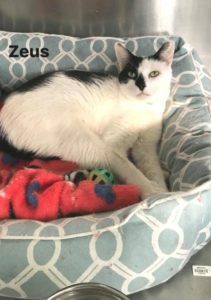 ZEUS suffered such a fright and an indignity…He was rescued from a dumpster, and then taken to Hempstead Town shelter. When Last Hope heard his sad story, we went and got him. He’s about 2 years old and has an adorable finger paint smudge on his nose. 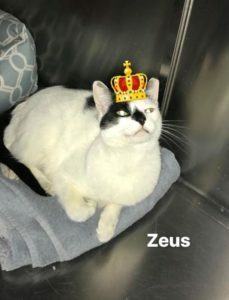 ZEUS deserves to be treated like the king of the gods. He is a loving mush who talks to you to get your attention. ZEUS likes to be held. He isn’t looking for a castle on Mt. Olympus. He wants to have a home of his own where someone treats him with love and dignity. Might that person be YOU? 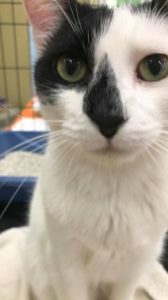 This entry was posted in Adopted, Adopted Cats, Adult, Cats, Male, Wantagh Adoption Center. Bookmark the permalink.